"July 21st is internationally recognised and commemorated as a day to remember those who have died as a direct or indirect result of drug use and/or misguided drug policies. 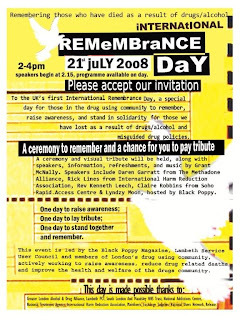 For the first time in the UK, an event will be held in order to mark this special day giving drug users, their families, their friends and those who work with them in the drugs field, an opportunity to come together and remember those who have died and stand in solidarity and unity with thousands of others across the globe." Black Poppy will host the event at Kennington Park -2-4pm (nearest Tube Oval). Please turn up promptly at 2pm for the ceremony and speeches. Rick Lines from International Harm Reduction Association will speak on the human rights violations & death penalty for drug users around the world. Reverend Kenneth Leech, who has been helping drug users and the homeless since the 1960's in central London . 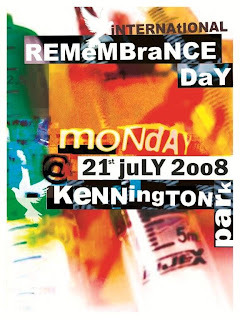 There will be a very special visual tribute and a remembrance book which people will be able to write in on the day and which will travel around selected drug treatment clinics, needle exchanges and drop-inns throughout London during the next 12 months, giving others a chance to write their own thoughts and remembrances. We will have acoustic music, refreshments, artwork from ArtsAlive (TBC), International Remembrance Day wristbands for everyone who attends to raise awareness of the day and limited editon Remembrance Day t-shirts, some free and some for sale on first come basis. Information about the event will be able to be seen at blackpoppy.org.uk and work on raising awareness of the issues within the event throughout the week. There will be overdose information and literature available. We will make copies of all the speeches available to people on the BP website after the event and a programme of the days proceedings will be available on the day. If you can, bring flowers or a flower or photographs, mementos, poems, of your friends and loved ones that could be held with you during the day, kept in the remembrance book forever. Don't worry of you can't, we will have something for everyone to lay visual tributes if they so wish. NOTE: Due to council restrictions on numbers, it is necessary wherever possible to RSVP as soon as possible, letting us know approx how many will be coming from your organisation or agency - ring or email BP as soon as possible to confirm your place. There is a ringfenced number for the using community to arrive without rsvps. This day has been made possible thanks to members of the drug using community and: Greater London Alcohol & Drug Alliance, Lambeth PCT, South London And Maudsley NHS Trust, National Addictions Centre, Exchange Supplies, Mainliners, International Harm Reduction Association, National Treatment Agency, National Users Network, Release.